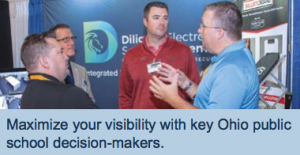 Maximize your visibility with key Ohio public school decision-makers by joining us at the 2019 Capital Conference and Trade Show. Click here to reserve your space now. Specialized tracks of learning sessions for transportation supervisors, curriculum directors, food service coordinators, administrative assistants and others draw additional district staff to the conference. Reserve now for the best booth location.